A massive artwork on wheels has been unveiled to promote the new Borders Railway throughout Scotland. With just six months to go until Scotland’s most exciting rail project in over a century is open to the public, Infrastructure Secretary Keith Brown revealed the 70 metre long train wrapped in specially-designed livery to promote some of the top attractions of those areas served by the new railway. 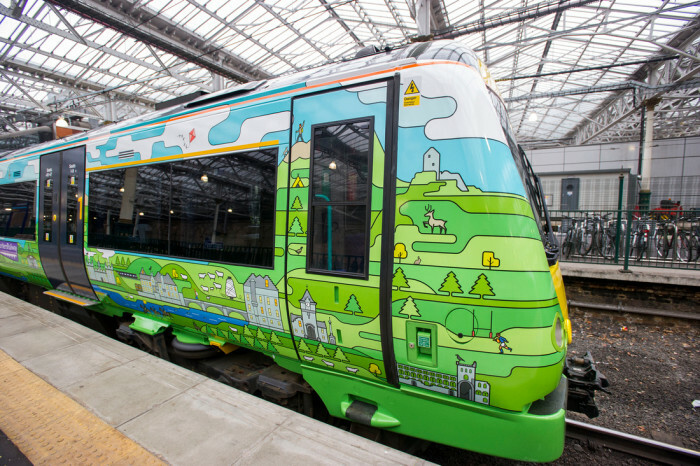 The livery has been designed to catch the eye of train-loving kids and rail enthusiasts as the three-carriage Class 170 travels between Scotland’s seven cities and it features illustrations of Edinburgh Zoo’s beloved pandas, Midlothian’s famous and historic Rosslyn Chapel and the Scottish Borders’ world-class scenery. “The Borders Railway is one of the Scottish Government’s biggest infrastructure projects and the longest domestic railway to be built in the UK in over a hundred years. “The communities of the Scottish Borders, Midlothian and Edinburgh will all benefit from the new work, study and social opportunities. But we also want to maximise the benefits by bringing people from all over Scotland to use this new line. “This train will enter normal service in the ScotRail fleet and will operate between Scotland’s cities, exposing the Borders Railway to many more people throughout the country. The Borders Railway will become operational for passengers in September. Construction of the 30-mile line is progressing well to be complete by June, when Network Rail will hand it over to ScotRail for 12 weeks of driver training ahead of the grand opening. As well as the commuter benefits, there will be a steam train experience to draw even more tourists to the former Waverley line. And a home is being built for the Great Tapestry of Scotland at the Tweedbank station. “This striking train will promote the Borders Railway the length and breadth of Scotland, and is sure to be a hit with families and rail enthusiasts alike.